My husband and I enjoy watching movies with our children, movie night makes for the perfect family activity on a weekend evening at home. Our latest movie night actually ended up being a Saturday movie marathon, we ended up watching four movies. Puss in Boots was one of those movies and it was hilarious! My eleven year old son and eight year old daughter both enjoyed the movie. They were both laughing, pointing at the t.v and really enjoy themselves. I think their favorite part was when they were doing the "Dancing Duel." The 'litter box' dance was great! I love how there were so many childhood favorites in the film: Humpty Dumpty, Jack and Jill, Mother Goose, Jack and the Beanstalk and so many more. It brought back so many childhood memories and characters that many have lost/forgotten over the years. Of course, Antonio Banderas is the voice of Puss in Boots and I could listen to him talk all day long. It was funny listening to my eight year old daughter try to talk like him as she was wearing the mask. So cute! She loves the masks and wears them everyday! The moral of the story was about following year dreams, forgiveness and loyalty! 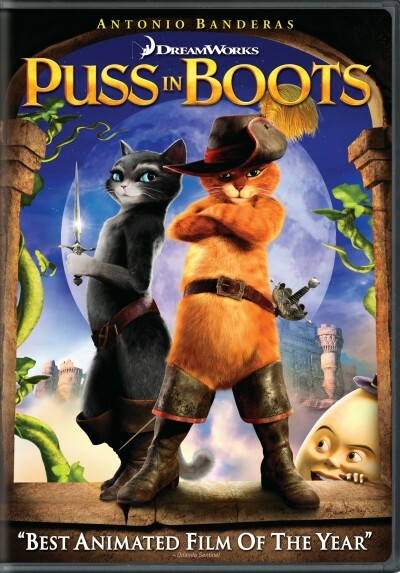 Puss in Boots is the perfect family movie. Nominated for the 2012 Academy Award for Best Animated Feature Film, DreamWorks Animation SKG, Inc.’s (Nasdaq: DWA) fur-ociously funny and globally renowned PUSS IN BOOTS makes a triumphant debut on DVD and Blu-ray on Friday, February 24, 2012. Hailed by critics and audiences alike, the film has been lauded as “hilariously funny” (Associated Press), “charming [and] brilliant” (Wall Street Journal) and praised for its spectacular visuals and glorious 3D animation. Filled with hilarious action and adventure, the true tail—er, tale—of how Puss became a hero long before he met Shrek delighted audiences of all ages with its non-stop laughs, daring deeds and original story. Featuring the extraordinary Antonio Banderas as the voice of the irresistible and legendary cat, PUSS IN BOOTS boasts a sensational cast of voice talent, including Salma Hayek, Zach Galifianakis, Billy Bob Thornton and Amy Sedaris. The PUSS IN BOOTS Double DVD and Blu-ray Combo Packs include the exclusive debut of an all-new adventure called Puss In Boots: The Three Diablos. Antonio Banderas returns to voice the title tabby as Puss plunges head first into a brand new adventure, picking up right where the movie left off. Tasked with recovering a princess’ stolen ruby and facing off against three mischievious foes, Puss embraces his destiny and once again proves why he is the stuff of legend. All of the Combo Packs also include loads of fun and surprises not seen in theaters, and the Blu-ray 3D + Blu-ray + DVD + Digital Copy Pack features both PUSS IN BOOTS and Puss In Boots: The Three Diablos in eye-popping, high definition 3D for the ultimate home viewing experience. **I received a DVD and movie viewing kit in exchange for my review. No other compensation was received. All opinions are 100% my own. Results may vary.